Suuri, avoin huone, jossa on altistuvat palkit ja maalaismainen tunnelma. Upeat näkymät 15 hehtaarin ja herrasmiehen tilan. Toimiva takka lisää toisenlaista rentoutumista. Oma kylpyhuone ja erillinen sisäänkäynti. Sviitissä on mukava ja rento maalaistuntotunnelma. On queen-vuode ja queen-ulosvedettävä sohva. Huoneessa on toimiva takka. Skylights tekevät sviitistä aurinkoa ja ilmavaa. Yksityinen kylpyhuone pieni kävellä suihku (ei kylpy). Pieni ruokailualue, jossa on kahvia, vettä, mikroaaltouuni, minijääkaappi ja välipaloja, auttavat sinua rentoutumaan matkoilla. Oven välillä on sviitti ja keittiön tärkein maalaistalo, tämä ovi pidetään lukittuna. Jos sinulla on kysymyksiä tai tarvitset apua, teksti on paras! We really enjoyed our week-long stay at the Rustic Farmhouse Suite. 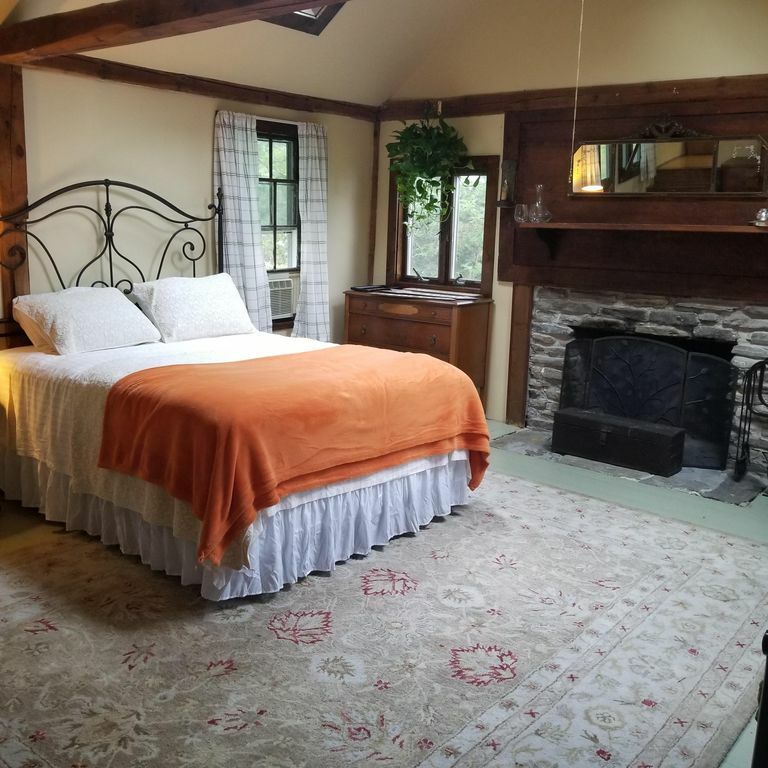 It is a beautiful and comfortable room in a unique farm setting. The owner and family were very friendly and their hospitality was amazing. An excellent, value Vrbo! Beautiful large private space with an amazing host! Cassie and John are great, very accommodating. Love the location and the property overall. Just a nice place away from the business of the city. We loved the antique rustic farmhouse . Very comfortable bed. Mostly we loved Cassie and her family. Very accommodating and friendly. We will be back! I loved staying at Cassie’s farmhouse. It was quaint and immaculate. These pictures don’t do it justice. The fireplace was glowing when I walked in through the separate entrance and the lanterns on the mantle add an extra feeling of coziness. What is not pictured is an adorable desk, a tv, a couch, and 3 steps up to a kitchen area with a table, microwave, mini fridge, & a K cup machine with coffee. There is also a full bathroom as well. 2 skylights and a ceiling fan. This house was so charming, with so much character. I woke up & while laying in bed I turned my head to see a beautiful sunrise over the farm land and looked up to the moon through the skylights. Loved the farm and the animals, the pet pig is adorable! Next door Cassie’s Dad turned an old barn into his vet practice & I got that tour which was really cool! The bed is so comfortable as well. If you love a farm feeling, and animals you’ll love it here. You can also take a walk through the fields. I loved it and Cassie was a pleasure! We had a wonderful time visiting the farmhouse suite! It was absolutely perfect! Quiet charming and restful! The fireplace was one thing we were really looking for and Cassie provided an endless supply of wood which we took advantage of! The snowfall during our visit was the icing on the cake. Everywhere we turned it looked like a Christmas card. We thought we had landed in a Hallmark movie! The space surprised me because it is bigger than it appears. There is a handy kitchenette area that is not really pictured and plenty of room to spread out. Anything we did not have was quickly provided by Cassie, including cookies right out of the oven. Her Dad gave us the grand tour of his vet clinic and the critters in the barnyard! We could not have been happier with our stay in Pepperell. We did not trek into Boston from there for sightseeing, but one could do that if you wanted to (it is only 1 hour away and very lovely scenery as you drive). Pepperell itself is very small with not too much happening but you could go any direction and find great scenery and small town charm... so this is a great central location for day trips! We will definitely be back if we are on the East Coast again!